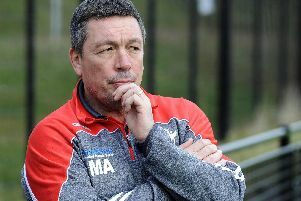 Long-serving Duane Straugheir is one of eight players heading for the Sheffield Eagles exit door after the club announced a number of departures. Following confirmation that the Eagles will return to the Steel City for the 2018 campaign, the rebuilding for their historic season has begun quickly as director of rugby Mark Aston looks to avoid last season’s rushed recruitment drive. Straugheir will end his five-year stay, which includes winning back-to-back Grand Finals, with the club saying he has received an offer from a club in League One. Also leaving is experienced prop and vice-captain Scott Wheeldon, who will shortly join fellow Championship side Featherstone Rovers. Jack Owens, Sam Scott, Perry Whiteley, Paddy Flynn, Jordan Cox and James Kelly complete the list, while Elliot Minchella and Garry Lo have already gone to Bradford and Castleford respectively. “It’s always sad when players depart but that is the nature of sport and they, and we, have to move on,” said Aston who is expecting to unveil new recruits shortly. “Some of the players we put offers out to, but they received very good offers elsewhere and we can’t criticise them for taking up these deals. “Being a rugby league player is only a finite career, so they have to do what’s best for them, and we wish them all the best. The departures of Cox and Kelly will have come as no surprise, with the former ending the campaign on loan at York. Kelly only made one senior appearance after joining at the start of the 2017 campaign. Centre Whiteley’s season was disrupted by injury, while Scott, who was in his second spell at the club, has accepted an offer with a League One club. Owens impressed after making his loan move from St Helens permanent towards the end of the season, but Aston has long admitted it would be tough to keep hold of the versatile operator. Experienced winger Flynn returned to the game to join the Eagles after a long career in the top flight with Widnes.